When I joined the agency, coming from Silicon Valley, I knew that there would be enormous cultural differences from a small, agile start-up environment. I had been a Pentagon analyst during graduate school for a short period, so I knew the enormity of the place. I also had the benefit of having worked in and around state and local government, plus a long stretch of academic political-science study of bureaucracy (I remember reading I.M. Destler’s pathbreaking works on bureaucratic policy-making in graduate school; imagine my surprise seeing him quoted this week in the Wall Street Journal as a pundit on the Clinton-Obama race and their political use of the NAFTA free-trade issue). Once I was on the inside in Washington, I began to form a concentric-circle model of the difficulties of implementing change in a large federal agency like DIA. I’ve just drawn this picture to capture the issues (click it to enlarge). I had come in knowing that DIA was large and had its own bureaucratic processes, but I had a great CIO and a clear-minded innovative Director to approve just about everything we wanted and needed to do. Beyond that, my eyes were also open enough to realize that as an intelligence agency, there would be unique and sticky peculiarities and difficulties to how we could proceed. These are spies, after all! Caution is their byword. The picture isn’t meant to imply that the Intelligence Community itself falls within the DoD, but their relative size and organizational mass. 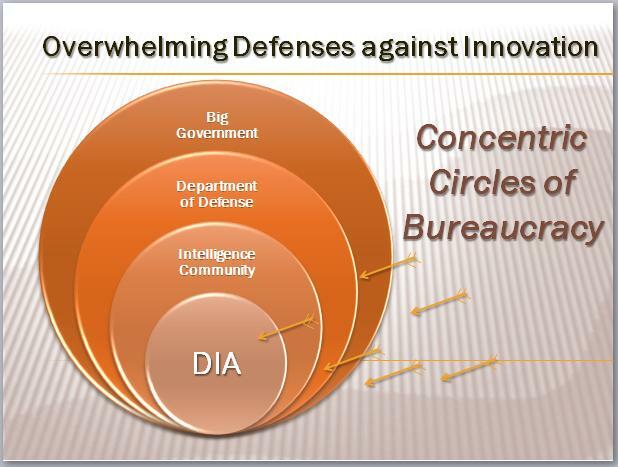 What I came to realize were the larger and more significant bureacratic hurdles imposed by the Defense Department reality, since DIA is also a DoD component. The Pentagon is enormous, and enormous organizations are not natural homes of nimble practices. And then, of course, there’s the Big Kahuna circle, “Big Gummint,” the federal government itself as an overriding constraint. Federal employees have an entire complex of bizarrely-incented practices and career motivations, which make progress on technology innovation very difficult, not to mention general business-practice transformation as a whole. The agency’s slim $51 million base budget is supplemented by about $21 million for an experimental craft and testing platform Stiletto, and it gets some additional money from OFT and the Science and Technology directorate for biometrics research and development. RRTO uses a variety of resources through partnerships with government, industry, academia and other countries, including Australia, Canada, Germany, Israel, Singapore and Spain. Obviously, with a budget that size and only a five-person staff (not counting contractors), the RRTO is doing a lot of outsourcing, which can make sense. That’s akin to my great revelation about how to break the surly bonds of bureaucracy; if you look again at the diagram above, you’ll note I drew it skewed at the bottom. I quickly realized that going directly to industry was the only way to succeed, so we set up a great number of direct relationships with industries and companies (large and small), and our own non-IC, non-DoD, non-standard communication mechanisms with outside technology innovators. Sometimes we bought their COTS products; oftentimes, we just emulated their ideas and approaches. So the key is, puncture the walls at their thinnest points. Go around the Maginot Line, not right through it. Or how about a Civil War analogy: when faced with massed forces, you can be like Gen. McClellan, and just sit there complaining of your inability to act. You can be like U.S. Grant or Sherman and try to bulldoze right through the wall – which is only possible with superior force and firepower. Or you can be agile and audacious like Robert E. Lee, daring master of the brilliant flanking maneuver. I described some of the ways we tried to act along these lines at DIA in a podcast I did with Jon Udell for his “Interviews with Innovators” series late last year, and in a recent NetworkWorld interview. And of course I’m now trying to use the Microsoft Institute perch to evangelize the same innovative approach for advanced technologies in government agencies at all levels. If you have other suggestions, send me an email. Great post. Representing Lucid Dimensions, a start-up company which is privately developing an infrared Spherical Sensor for applications in Defense and HLS, I have to say that your point couldn’t ring more clearly. It is a difficult, sluggish, and frustrating process breaking through these barriers and most times seems bogged down by bureaucracy. I just found out about the RRTO in the July 2008 issue of “National Defense Magazine” and hold hopes that this office might be able help accelerate our efforts to develop and commercialize our crucial technology. I found obtaining a website, contact info or other information about the RRTO nearly non-existent. Any ideas of how I can find these people or similar types of organizations? Thanks! Concentric means sharing the same centre. You’re absolutely right. I’m both kicking myself that I used that word (I would rather change the word than the diagram, as I intended the shared border), and surprised that no one else has pointed out the error until now. Thanks for doing so 🙂 and I’ll try to be more precise in future. Moron, what the hell is big government anyway? The most successful countries are social democracies, where business is checked by government and social safety nets are in place. So STFU idiot.